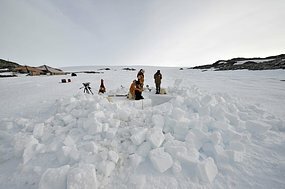 A heavy duty metal detector is being brought into Antarctica to scan for a plane used by Australian explorer Sir Douglas Mawson. He took the flying machine to Antarctica in 1911 and the Mawson's Huts Foundation wants to find it. The search for Sir Douglas' plane has captured the imagination of Tony Stewart, who is leading the team of expeditioners who will spend this summer down at Commonwealth Bay.